Hemostasis is a process that stops the flow of blood due to damage or injury. There are three steps in the process of hemostasis: vascular constriction, platelet plug, and coagulation (or blood clotting). Coagulation is the most complex and important step in hemostasis, which changes blood from a flowing liquid to a solid state. When a person's blood vessels are damaged, hemostasis begins its three steps to arrest bleeding. The three steps are a vascular constriction, a platelet plug, and a coagulation. The explanation of a vascular spasm and a platelet plug is followed. However, the explanation of coagulation will be located on the next section. • A vascular constriction is a constriction of the damaged blood vessel which occurs at the site of injury. Vasoconstriction is initiated by the smooth muscle of the blood vessel in response to the injury and by nerve signals from pain receptors. a. Platelet adhesion. 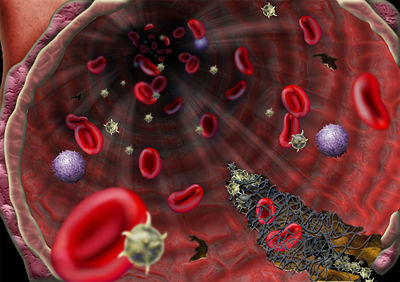 Platelets adhere to the exposed collagen fibers in the damaged blood vessel wall. b. Platelet release. Platelets release ADP (which attracts other platelets to the injury), serotonin (which stimulates vasoconstriction), and thromboxane A2 (which attracts platelets and stimulates vasoconstriction). Cellular extensions from the platelets interconnect and form a loose mesh. c. Platelet aggregation. Additional platelets arrive at the site of the injury in response to the released ADP and expand the accumulation of platelets. 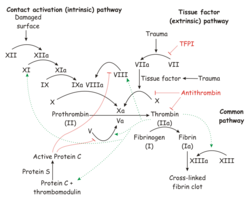 Coagulation (or blood clotting) is the most complex stage of hemostasis. 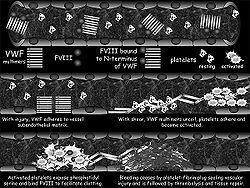 A blood clotting consists of a plug of platelets enmeshed in a network of insoluble fibrin molecules. Blood clotting requires calcium ions (Ca2+) and about a dozen other protein clotting factors.There are three major steps in the coagulation process in involving prothrombinase, thrombin, and fibrin. Prothrombinase is an enzyme that is produced when blood vessels or some other tissues are damaged. 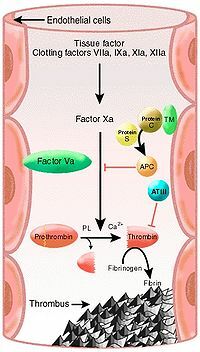 Prothrombinase is also called 'coagulation factor II' (F2). Prothrombinase occurs in blood plasma. Prothrombin is produced by the liver and the liver puts prothrombinase into the bloodstream. The next step is thrombin; another enzyme that prothrombinase converts prothrombin. After the second step, thrombin, the last step occurs when thrombin interacts with fibrinogen. Fibrinogen is one of the proteins in blood plasma. Fibrinogen is converted into fibrin when thrombin interacts with fibrinogen.. Blood clotting system is controlled by antithrombin III, heparin, protein C, vitamin K, and warfarin (Coumadin). Antithrombin III is a plasma protein (a serpin) prevents the formation of thrombin by binding to prothrombin. Heparin is a mixture of polysaccharides that bind to antithrombin III. Protein C is a protein that sits at the center of the control mechanism system. It excess thrombin binds to cell-surface receptors, called thrombomodulin. Vitamin K is a cofactor needed for the synthesis of protein S. Lastly, warfarin is another name of blood thinner because it is an effective vitamin K antagonist. ↑ Definition of Hemostasis Maureen Habel, RnCeus. ↑ The Medical Biochemistry Michael W. King, Ph.D, IU School of Medicine, February 24, 2011. ↑ Steps of Hemostasis Unknown, Cliffnotes. ↑ 4.0 4.1 Blood Clotting John W. Kimball, Kimball's Biology, January 11th, 2011. This page was last modified on 31 December 2012, at 19:19.